There’s an Ethiopian restaruant in Denver that we go to every summer when we’re there visiting the nieces. It’s kind of in a sketchy part of town. It’s in a seen-better-days strip mall. The sign out front has faded to oblivion. It takes almost an hour to get your food (definitely made from scratch). They’re kind of grumpy. We go every year. It’s that good. This little place has inspired me to make my own Sambussa, Shiro Wat, and Injera (with varying results). On our last trip, we had a delicious cold salad on our platter that reminded me almost of a tabouli. After some research, I found it it was probably a Timatim Salad. An authentic timatim has shredded injera which is probably what I mistook for a type of grain. Not having any true North African markets here and definitely not wanting to make my own injera again, I decided to morph the Timatim recipe into more of a vegetable salad. I used a fresh cucumber, tomatoes, and jalapenos from our garden for this one. Berbere is a aromatic mix of paprika, black pepper, coriander, nutmeg, ginger, allspice, chili, fenugreek, cardamom, cloves, and garlic. 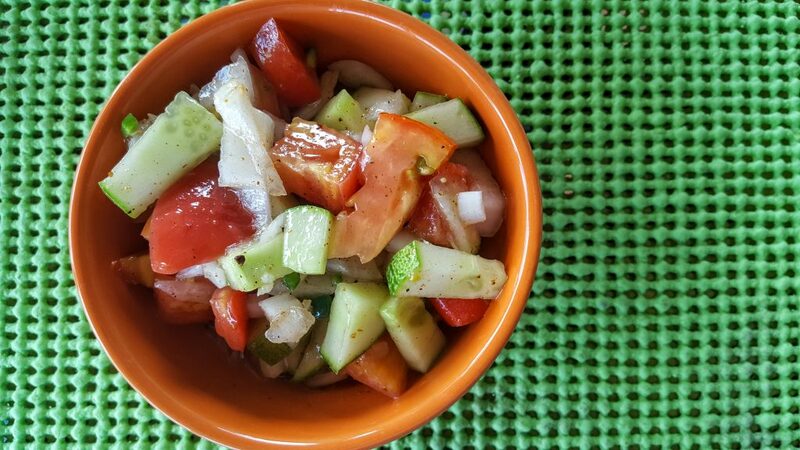 The East African berbere spice gives this salad its unique taste. Prepare vegetables and place in a large bowl. In a separate small bowl or measuring cup, whisk together the grape seed oil, vinegar, lemon juice, garlic and spice. Pour dressing over vegetables and toss to combine. Cover and place in refrigerator to let marinate for at least thirty minutes before serving. 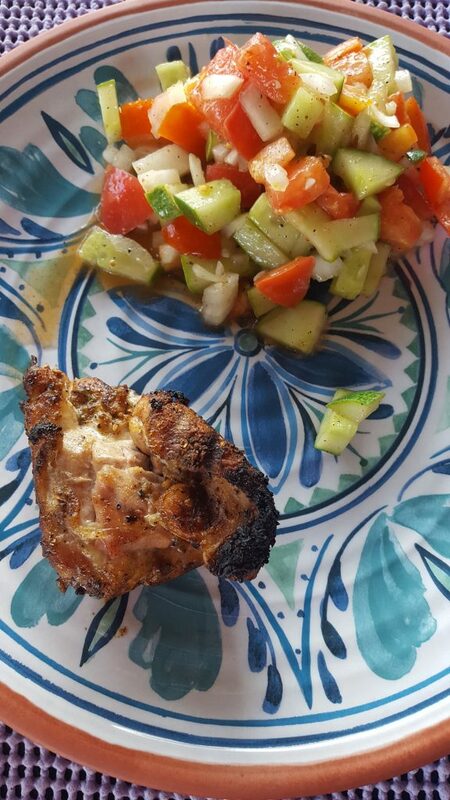 We went crazy with that berbere spice and added it with a bit of olive oil to some chicken thighs. Grilling them smelled delicious and they were a great accompaniment to this salad. If you want to try your hand at making your own spice blend, try this recipe. Be assured that we will as soon as our tin of premade mix runs out. If you would like to see my review(s) of the restaurant that inspired this salad, see below. 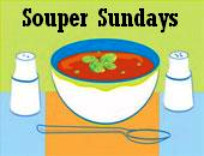 I’m also linking up with Deb’s (Kahakai Kitchen) Souper Sunday. I bet you will love this spice, Tina! Berbere mix sounds like something I would really love too. The veggie salad looks wonderful, Deb. And, it only gets better with age. Great leftovers. I’m really intrigued! Your salad looks lovely with all the fresh veggies—and thanks for explaining what’s in the berbere seasoning. I hope to make it to an Ethiopian restaurant to try it myself one day! Hope you get the chance, Liz. If not, make your own! That is so funny, even though the service is not that great you still go back – must be the food! I do like Ethiopian and Eritrean food, either offered by people (volunteers) i work with (from that part of the world) or home-made, I have never been to a restaurant as of yet, but there is one in a shady part of the town i work and I really want to visit. This salad with its flavours sound good, i do like Berbere and have experimented with it lot. Do you like spaghetti – you must make Zigni. I will certainly research Zigni! Thanks for the tip! Yum! I love fresh and healthy veggie salads! Can’t wait to start the day with it! I love Berbere. I made some ‘blistered berbere chickpeas’ for a book review a while back and they were so good–your post makes me crave them and your salad too! 😉 Thanks for sharing it with Souper Sundays this week. MMMM… I need to go back to your chickpea post! I’ll be needing to make a batch soon myself. YUM! THIS SALAD SOUNDS LIKE something my mouth would truly want to be apart of!!!!! 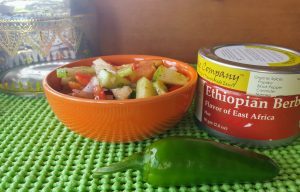 This girl loves herself some veggies – without dressing, just seasonings LIKE BERBERE! Love Ethiopian food, sounds liek this place is worth the hiccups. I never had this salad and looks great. But I got confused because I did not know Berbere is a spice mix, in French Berbere is the ethnic group lol. I’ve never made injera, and I doubt if I ever will. That’s work! Anyway, Ethiopian food is wonderful, isn’t it? And this salad looks SO flavorful. Thanks! Yep, I doubt I ever make it again either. I would gladly eat it though (if somebody else put in the time). I love Ethiopian food and I can see that I need to find some of the berbere spice. Great salad! Actually, I ordered mine from Amazon but since then I have seen it a number of places…..